We stayed early April 2019. Overall, it was a great stay. The owners are awesome! They are very attentive and helpful. This was our first official camping trip in our new camper and we did forget some things. They helped us in every way possible. The campground is a little older but they are actively trying to improve each site. During our stay we watched as they were improving the sites. I will say the back in/seasonal sites are not level. Many of the campers were braced with cinder blocks and 6 to 10 inches of wood. The pull through sites and the back in sites near the main bath house are very level and we only had to use about 2 inches (two blocks) to level our camper. Water pressure, cable (25 Channels) and power was perfect. Some of the nearby seasonal campers were getting a little out of control and the owners went to them and nicely handled the situation. We had no issues and had two very peaceful nights rest. Everyone in the campground was pleasant and were willing to help throughout our stay. We will definitely visit again! First the good. Our site had 50 amps and reasonable water pressure. Staff was very nice and friendly and office/store had a lot to offer. Now the disappointment. Sites are very narrow and all sites seem to have an abundance of trees which makes getting into sites very challenging. Sites are short and both roadways and sites are not marked well at all. Road going into campground is narrow and uneven. Sites are all gravel and not level. This is not a big rig friendly campground. We stayed in our 45 motor coach. I would not stay here again. Even though the campground is a little run down it seems like it could be a great family fun place. The one thing that irritated me the most is that the quite hour is after 11pm, I'd bout other people but my 1 year old goes to bed before 9 and people blasting music after 10pm waking my child is not appealing. 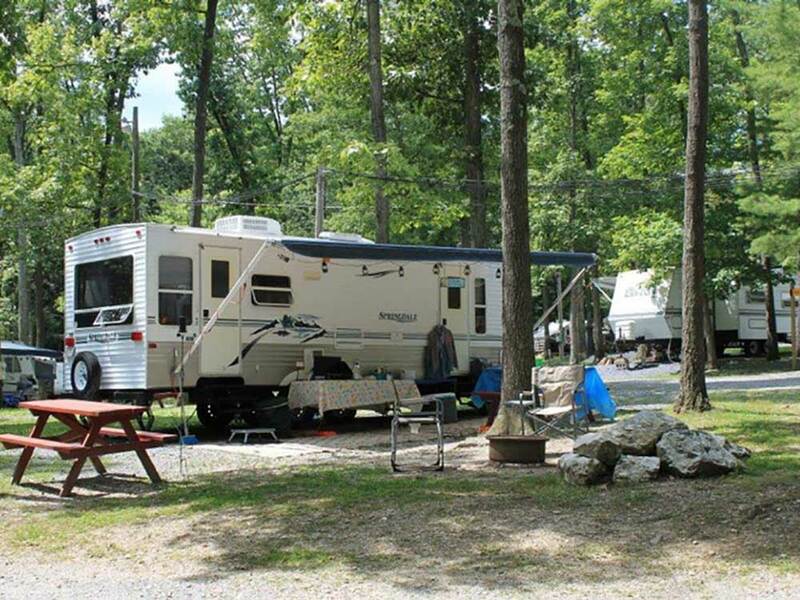 It looks like a family campground but doesn't have the rules that usually come with that type of place. I stay here often. The new owners bought this campground about three-four years ago and are doing very well at fixing it up and making it better. Yes some of the sites are small because this is a very old campground. But the newer added sites are just fine for space. They have a great play area for kids and they do a lot of activities for kids. They also have some great music weekends as well. I give them a five star because although maybe its not perfect but they work really hard at making this place the best it can be. The facilities and the grounds are very nice. Only drawback is that many of the sites are very small.